Description: This 9 foot tall, 900-pound bronze statue of Dale Earnhardt is clad in jeans, cowboy boots and a short-sleeved shirt. His arms are crossed on his chest in an apparently jovial gesture. The statue of the NASCAR driver stands in the middle of a circular granite base. Two small plaques sit on the front of the base. This monument is a work in progress, as there are plans to add 76 granite sections, one for each of his Winston Cup wins. Plans also include the installation of benches and plants around the plaza, many of them with the number 3 (Earnhardt's racing number) incorporated into them. 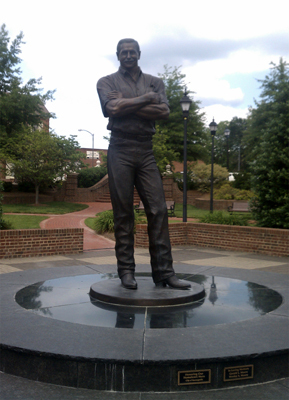 The city of Kannapolis began planning a memorial to Earnhardt in May 2001. 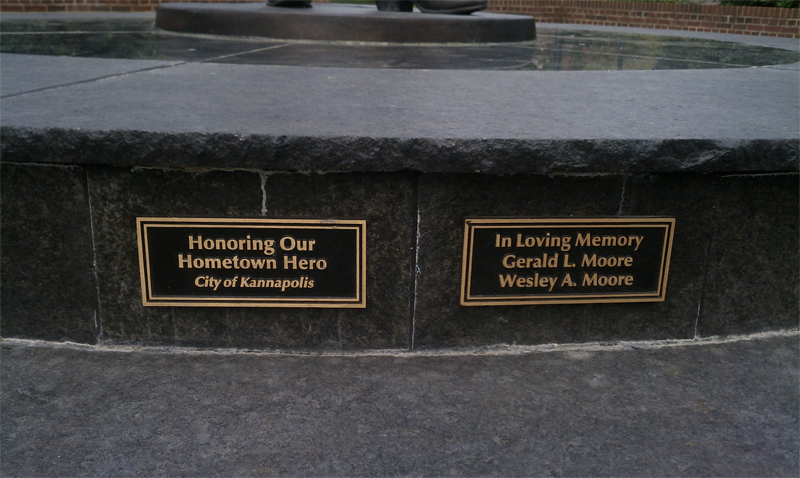 Post dedication use: To help fund the remainder of the planned design, the city of Kannapolis has began selling non-commercial brick inscriptions on the site. Subject notes: Dale Earnhardt, Sr., (April 29, 1951 "Ã February 18, 2001) was a famous NASCAR driver from Kannapolis, NC who won seventy-six races. Earnhardt died in the final lap of the 2001 Daytona 500. Location: The statue is located in the Dale Earnhardt Plaza, a part of the Cannon Village shopping center off of South Main Street between West A and West B streets.